"Welcome to the Darien Waterfront Inn Bed and Breakfast, your home while visiting Darien, Georgia –the 'hidden gem' of Georgia's Golden Isles and gateway to Sapelo Island. After a trip to Sapelo Island, sit back and relax on our porch, take a walk along the historic waterfront, or enjoy some fresh local seafood as the sun sets over the Darien River." 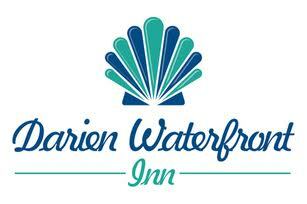 The Darien Waterfront Inn is all new and we cannot wait to share it with you! We offer 5 beautiful rooms decorated in coastal charm. Situated on the Darien River bluff - every room has beautiful views of the marsh and river and all open onto a spacious porch meant for relaxing. Sip a glass of wine, read your favorite book or just sit back and let the breeze of the Darien River soothe your soul. New Location! After eight years of hosting guests in the old historic warehouse, we are proud to welcome you to our new 'home' for the Darien Waterfront Inn. Our newly constructed B&B is full of coastal southern charm with all modern amenities! Shades of calming blues, whites and grays welcome you throughout the home. Spacious rooms, luxury tiled baths, with access to a roomy porch and views across the Darien river and marsh make for a relaxing stay. We are a short walk to everything Darien has to offer, but as you unwind on the porch and gaze across the marsh you feel miles away from it all. Enjoy a fresh cup of coffee on the porch and watch the sun light up the marsh as we prepare a hearty breakfast to start your day of exploring historic Darien, Georgia. Darien is conveniently located off I-95 at exit 42 or 49 and accessible by boat from the Intracoastal Waterway.